Another quick and easy dessert for Passover is chocolate fondue! Just make sure to use kosher for Passover chocolate if you are making the recipe for Passover. What is kosher for Passover chocolate? Well, it is chocolate that does not contain lecithin. Lecithin is a soy-based emulsifier that helps bind and smoothen all the chocolaty goodness in most chocolate. The several different types of chocolate that I had in my pantry contained lecithin, including Valrhona, Callebaut, Scharfenberg and Lindt! Chocolate fondue is a dessert that is good for any occasion. I served it with fruit including: pineapples, strawberries, raspberries, clementines and bananas (which mysteriously disappeared when I photographed the dessert). To complement the chocolate and fruit, I often like to have small madeleines or small cubes of pound cake. Since flour wasn’t an option, I decided to try a new recipe. I recalled that, about a month ago, Ivonne from Cream Puffs in Venice posted her family’s amaretti recipe and the pitures looked spectacular. The recipe also contained no flour. So, instead of making something cakey, I made Ivonne’s wonderful amaretti. Thanks Ivonne! The key to this dessert is good quality chocolate, fruit and almonds as the recipes are simple, straightforward and very satisfying. 1. Chop chocolate up into small pieces. 2. Heat cream in the microwave or boil cream on the stove. 3. Pour the hot cream onto the chocolate and let it sit for 10 minutes. 4. Stir the chocolate and cream mixture until smooth. 5. The ganache can be made ahead – just heat the ganache for 30 seconds or until warm before serving. 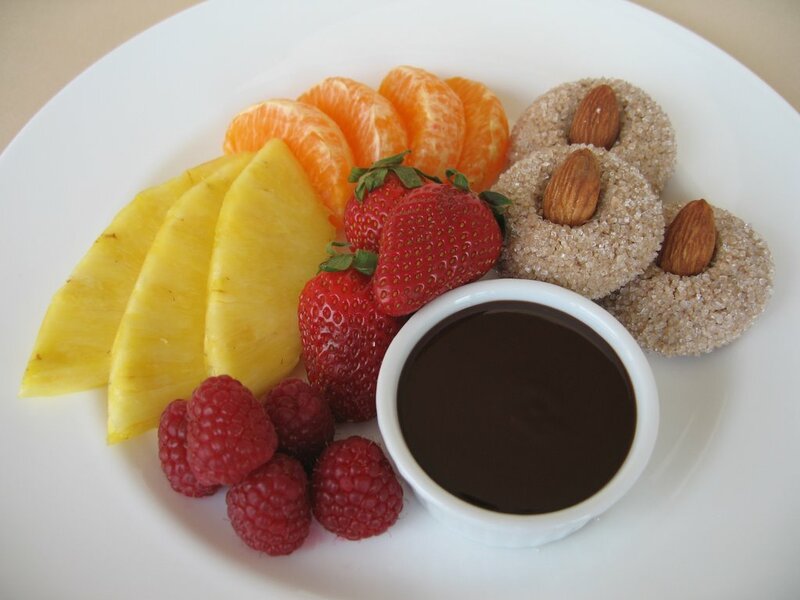 Serve the chocolate fondue warm with the fruit and cookies. I like to serve the chocolate fondue in small, individual, ramekins so that everyone can dip as much as they want! Posted by Sam at 8:53 p.m. I'm enjoying your blog very much. I love how precise and observant you are about your cooking. And, of course, it is all so beautifully arranged and clear. You are doing a very nice job, and in your own distinct style, too. Looks so delicious! The Ameretti's seem to go perfectly with fondue, I would of never thought of that! I am happy to hear that your are enjoying my blog and that you think that I have my own distinct style! I really appreciate your comments. I have to say that I am finding alot of inspiration and encouragement from fellow bloggers; Thank you everyone! I also really enjoyed participating in the event that you hosted. Again thanks! The amaretti are a little chewy in the middle. The recipe is from Ivonne and they are mighty fabulous. Thanks for the tip about Nino D'Aversa. When I tell my mother that you tried her amaretti recipe and that they turned out so beautifully she is totally going to love you!!! What a great post. While I'd heard of lecithin I had no idea that most chocolates contained it. That fondue sounds incredible ... we're going to have to organize some kind of huge blogger meeting where we all get together and make all of these amazing recipes. Thanks so much for trying the amaretti, Sam! I'm glad you enjoyed them! I was so excited about the amaretti I spelled my name wrong. This is Ivonne's mother. I'm honoured that you tried my amaretti recipe. They look perfect! Your arrangement is beautiful. The amaretti was a hit! This is one of those cookies that I am definitely going to make time and time again. They were even better a few days later. Thanks for posting the original recipe. First of all, thank you for sharing and allowing Ivonne to post the original recipe. Second, I am the one who should be honoured, I hope I did the amaretti justice. Third, your family is just plain lucky! Thanks for visiting Maria.